The Pyle PLCM18BC rear-view backup parking assist camera mounts above your vehicle's license plate. Pair it with an in-vehicle monitor display screen, for a quick and easy way to add safety when on the road. This camera adds low light capability, true color reproduction, all-weather performance -- and it's all housed in marine grade waterproof and fog resistant construction. The camera outputs a clear, vivid picture along with distance scale lines to help you drive safer and to get into those tight parking spots. System includes all the necessary cables and wiring for installation. Built-in low light performance for dark environments helps you steer when visibility is limited. 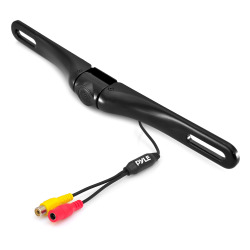 Drive safer and smarter with the Pyle PLCM18BC parking assist backup camera. Does this camera send stereo audio beeps when I'm reversing?